Drones are saving time and money on the construction site, thanks to advances in data collection technology. Courtesy PCL Construction. The drone market has seen an incredible explosion in the past several years. Widely available models, costing well below $2,000, have contributed to an increase in sales, from $44 million in 2013 to an estimated $1.3 billion this past year. On the consumer side, it’s a hardware-driven boom: inexpensive drones that fit into a backpack and fly with gamelike control sticks. But for businesses—especially construction companies—looking to use drones, the democratization has been driven by software and data advances. 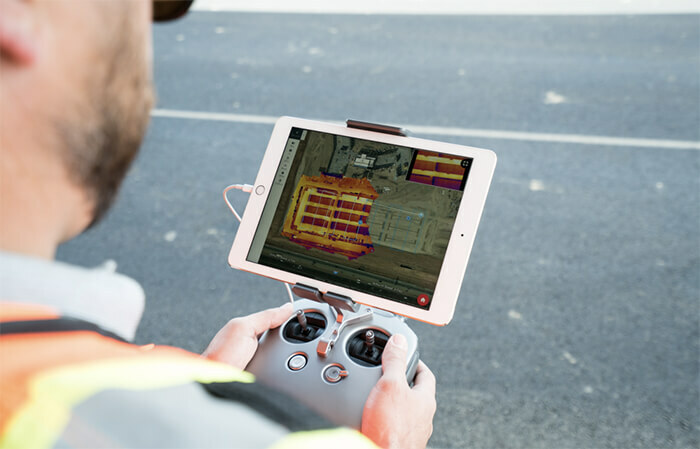 A handful of companies specialize in drone app- and cloud-based services that collect data and imagery for construction-site use. It works like this: An app on a tablet allows automated flight paths to scan a given area. This scan is then uploaded to a cloud-based photogrammetry engine that takes the raw imagery and processes it into map and model forms, which are shared across a web-based platform. Once uploaded, this data comes back as TIFFs and other photography formats, topographic maps, point clouds, and 3D mesh files. The result is a near-real-time digital twin of what’s happening on a construction site—one that can be updated daily, offer visual fidelity within an inch, and integrate with Autodesk BIM 360 and GIS. This data allows comparisons of built structures to designers’ models to plan work and spot mistakes before they become chronically expensive to fix. DroneDeploy’s Live Map collects data from drones on site, providing instant insights before uploading information to the Internet. Courtesy DroneDeploy. Discover the software that puts drone data at your fingertips. On any construction project, the three primary drivers of efficiency are time, quality, and cost—and drones can help with each. Fundamentally, a drone can move across a site faster than a person, streaking through the sky without having to weave through trenches and parked trucks or slowly ascend scaffolding. 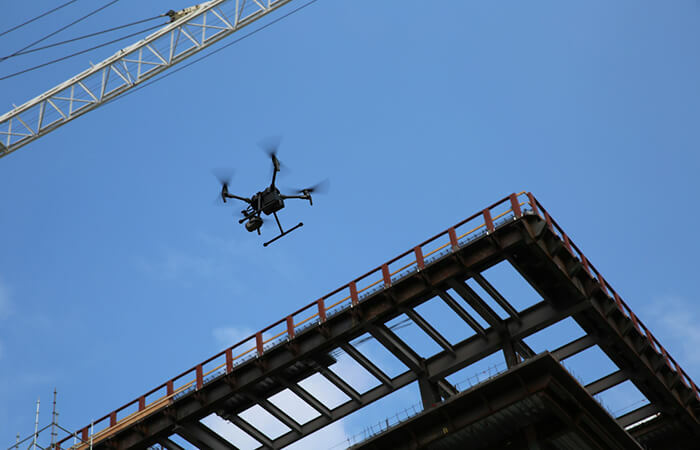 Contractor Trubeck uses drones to capture data on site as it builds Uber’s new headquarters in San Francisco. Courtesy 3DR. Hugh McFall, product marketing manager at 3DR, offers more examples of projects being streamlined with the help of drones: 3DR worked with the Arizona Department of Transportation to use its Site Scan app to survey a site for a bridge-replacement project, reducing surveying time from a full day or longer to just 30 minutes. In Qatar, Arcadis used Site Scan to perform earthwork stockpile measurements for a highway, completing work 10 times faster than usual. Notable 3DR customer projects include contractor Trubeck’s use of drones to capture aerial imagery for as-built models and progress reporting as it builds Uber’s new San Francisco headquarters. The cloud-based photogrammetry engines that translate drone data into usable formats also automate what had been a more manual process. For example, DroneDeploy’s real-time photogrammetry engine doesn’t require uploading to the cloud: Its Live Map feature stitches together 2D maps as the drone flies by processing imagery without an Internet connection, providing instant insights. Once this imagery is shared across a web-based platform, it’s available to entire project teams, with tiered permissions and access restrictions. “Drone data enables people who aren’t on the jobsite to contribute,” says Mike Winn, DroneDeploy’s CEO. Different camera types add new functionality. Thermal cameras, for example, are particularly useful for solar-panel inspection to detect heat leaks or waterproofing issues on façades and to monitor curing concrete. 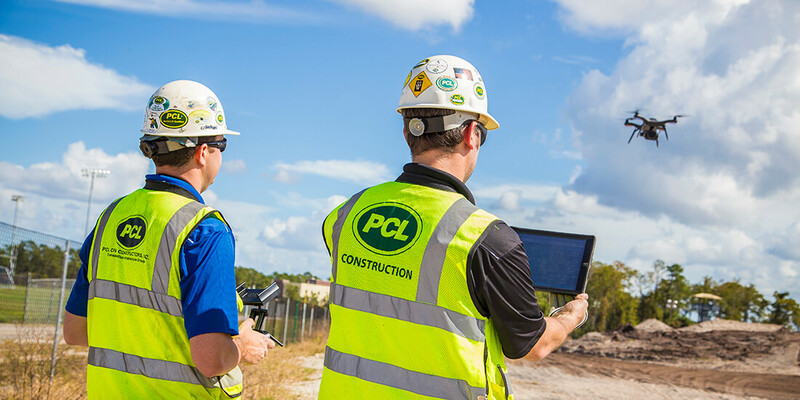 PCL uses drones to measure site contours to manage runoff, as well as maintain necessary clearances from adjacent utilities. Courtesy PCL Construction. Even before pulleys start creaking and arc welders rain down sparks, drone data can make construction sites safer. 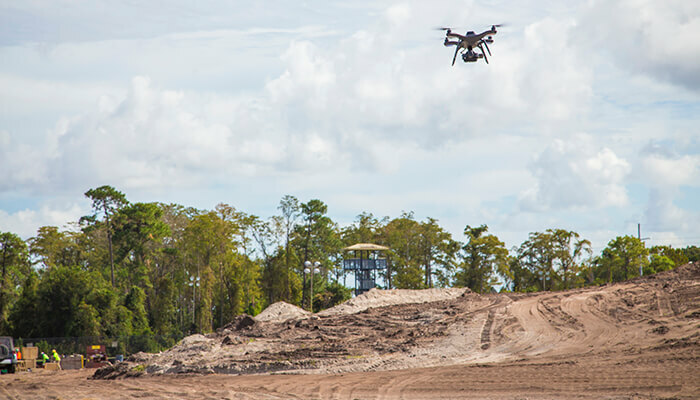 Bennington says that drone data and imagery are critical in assembling site logistics plans and orienting new contractors to safety protocols. Instead of pointing at a crude map of the site, he can walk builders through a 3D representation (or twin) of the project. An intuitive next step for drones is to physically interact with structures; already, drones are being used to deice wind turbines. But data and workflow interoperability are the most pressing concerns for builders and drone-data companies. Mildworth also wants to see how machine learning can be applied to drone monitoring. “I think the next step would be to take all of that in an even more automated way, where the analysis would be based on AI,” he says. Here, machine-learning protocols generate a set of recommendations and priorities for resolving issues on a construction site, compiling lessons from past experiences and applying them to future jobs. A drone could warn staff if deadlines are in danger of slipping and if site measurements don’t match specifications or recognize if builders are not wearing hard hats.